Kumar's remarks came in the backdrop of Singh expressing unhappiness over his Nawada seat going to ally LJP this time. 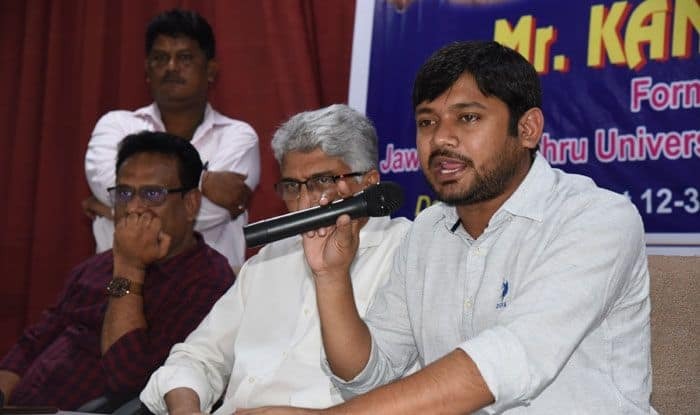 Union Minister Giriraj Singh’s “reluctance” to contest Lok Sabha polls from Begusarai was comparable to a kids refusal to attend school in the event of failing to complete his homework, the CPI candidate from the seat Kanhaiya Kumar has said. “Watched the news on TV and learnt that the BJP minister known for sending off people to Pakistan on free of cost tours is not ready to come to Begusarai for contesting the polls,” Kumar said in a Facebook post late Monday night wherein he did not mention Singh by name. A firebrand BJP leader, Giriraj Singh had caused a stir ahead of the 2014 Lok Sabha polls when he said “those opposed to Narendra Modi should go to Pakistan”. He has continued with similar outbursts since then, the latest instance being his threat that those not coming out in support of the Prime Ministers Patna rally on March 3 would be deemed “anti-national” even though he himself ended up remaining absent on account of ill-health. “I have a nephew who, similarly, refuses to go to school whenever he fails to do his homework. But even he never thinks of sending the teacher to Pakistan. Neither does he hate anybody nor he wants to get anybody expelled from the school”, Kanhaiya Kumar added sarcastically in the post. “This is the real India, vastly different from the shrill debates one watches on news channels”, the former JNU students union president, who first came into limelight upon being booked for sedition in connection with alleged raising of anti-national slogans at a function held inside the varsity premises. Kumar’s remarks came in the backdrop of Singh expressing unhappiness over his Nawada seat going to ally LJP this time. On Monday, he camped in New Delhi where he is believed to have tried to apprise the BJPs top leadership of his sentiments. Singh is at present the BJP MP from Nawada Lok Sabha seat. “However, after five years of having nurtured a constituency I am being asked to give it up … I consider it a privilege to contest Lok Sabha polls. But this must not happen at the cost of my self-respect”, Singh said. He also hastened to add “I have no complaints with the partys central leadership. It is the state leadership which has betrayed my trust”. Notably, when the news first came out that BJP will be forgoing its claim on Nawada, implying that Singh would lose his sitting seat, the Union minister had thrown a fit and complained that state president Nityanand Rai had promised that “I would get a ticket from whichever seat I choose”. Comprising pockets which have a very strong presence of the Left, earning it the epithet “Moscow of Bihar”, Begusarai was won by the BJP for the first time in 2014. The seat has been lying vacant since the death of sitting MP Bhola Singh in October last year.